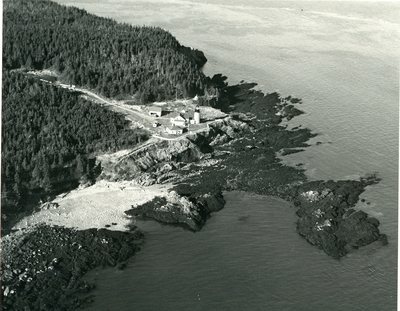 A black and white aerial photograph of the West Quoddy Head Light in Lubec, Maine, taken by Jim Garvin, official photographer for the University of Maine in the 1950s and 1960s. Handwriting on the back of the photo says, "Quoddy Head Light Oct. 1959."